A bloodthirsty space alien terrorizes the inhabitants of an isolated Arctic research station. Kenneth Tobey (Strange Invaders) is convincing as a take charge military type. Margaret Sheridan, as the only female at the base, has great chemistry with Tobey. 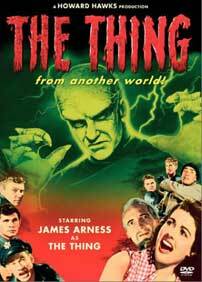 James Arness (Gunsmoke) plays the Thing, a role he sems to have been picked for because of his over six foot height. Many people believe that producer Howard Hawks directed this movie. The cast includes: Kenneth Tobey, Margaret Sheridan, James Arness, James Young, Robert Cornthwaite, and Douglas Spencer.